Conditions dominated at the first day of the Downeast Cyclocross Weekend at Pineland Farm in New Gloucester, Maine. A week of heavy rain topped by two dry days meant the low-lying course had plenty of time to go from soup to bog. Early in the day, racers had been forced to run long sections of the course, but as the Elite Women toed the line, conditions had turned for the better with the mud finally tacking up and lines becoming firm. On the final two laps of the women’s race, however, the rain came again, turning the corners back to grease in time for the finale of the women’s race and the men’s event. From the start of the race, it seemed like it would be a duel between Sally Annis (crossresults.com p/b JRA Cycles) and Andrea Smith (LadiestFirst Racing). The two at the front had put a large gap behind them within the first lap. For much of the race, it was between Smith and Annis, neither able to make any appreciable gap on the soft and relatively slow course. From behind, with three laps to go, came Lyne Bessette (cyclocrossworld.com), finally completing the bridge to the leaders. The three rode together for a lap until Smith attacked and Annis came slowly off the chase. Smith was able to hold it together in the difficult conditions and cross the finish line first with Bessette close behind and Annis third. As has been the case in so many New England races this year, Dylan McNicholas (cyclocrossworld.com) shot off the front from the start. Today, his companions included Luke Keough (Champion System p/b Keough Cyclocross) and Adam Myerson (SmartStop/MOB p/b Ridley). Not far behind was the man with the long East coast winning streak, Justin Lindine (bikereg.com/Joe’s Garage). As the course had softened thanks to the rain during the women’s race through the start of the men’s, the course had returned to its prior state of slop and the biggest moves in the race were dictated by mechanical problems. With four laps to go, McNicholas and Lindine were driving the pace on the front and had begun to build an advantage over their competitors, but a broken derailleur hanger far from the pit forced Lindine to run nearly half a lap and lose several positions. McNicholas took this advantage and drove a hard but safe pace, riding gingerly through the grass sections and taking few risks. 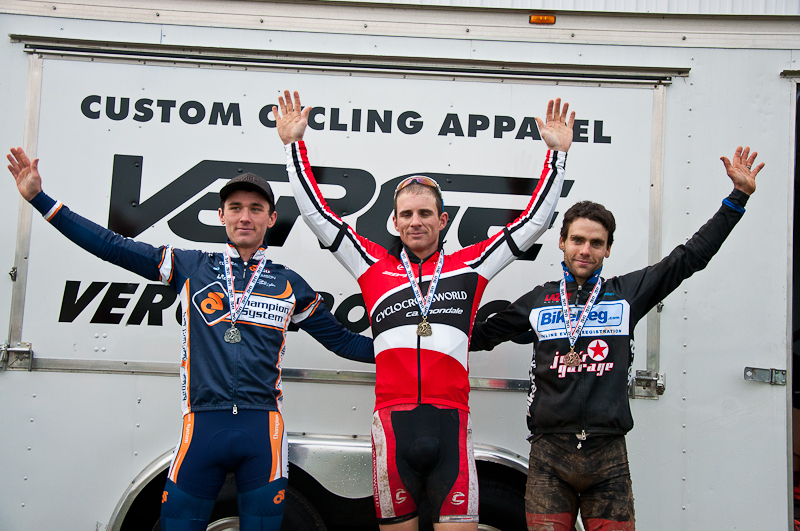 When all was said and done, McNicholas was able to raise his hands for the second consecutive year at the Downeast Cyclocross Weekend as the Saturday victor. Behind him, and always closing was Luke Keough. The battle for third was between Myerson and the surprisingly resilient Justin Lindine. Coming past the pit with two laps to go, Lindine caught and passed Myerson. 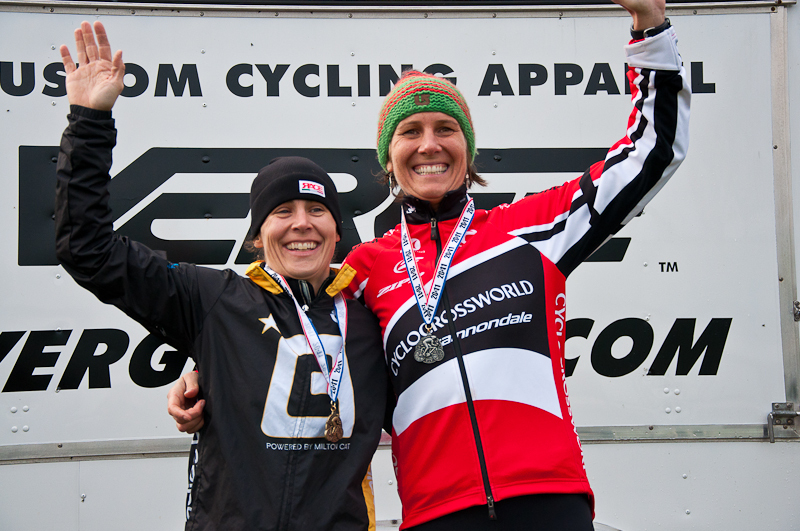 “I was trying to ride a fast, safe line and Lindine came past me like a freight train,” said Myerson after the race.